This paper explores the association between corruption and trade policy. 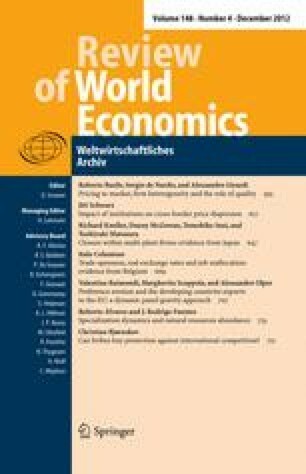 A non-technical theoretical framework first outlines the effects of corruption on non-tariff barriers at the political and bureaucratic level. Both parts have incentives to accept bribes in exchange for increasing barriers. These considerations include politicians’ re-election motives, implying that free information may weaken the association between corruption and trade barriers. I employ panel data on corruption and non-tariff barriers in three periods 1995–2005. The results show that corruption tends to lead to higher non-tariff barriers. The effectiveness of corruption in buying barriers varies with the degree of press freedom and GDP per capita. The online version of this article (doi: 10.1007/s10290-012-0128-z) contains supplementary material, which is available to authorized users. CIRI (2007). Cingranelli-Richards human rights data project. Available at http://ciri.binghamton.edu/. Accessed May, 2007.